Trekkie parents, dinnertime just got out of this world! 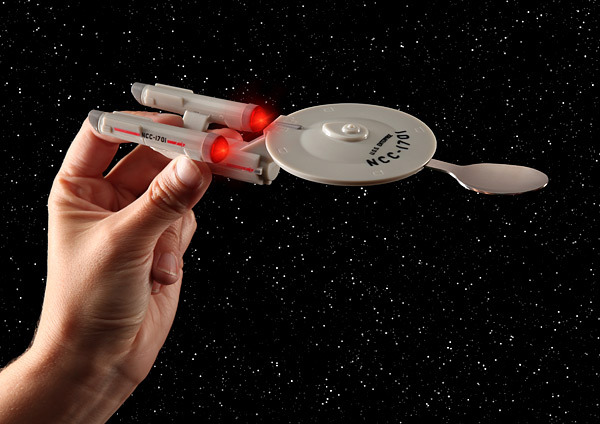 Get geeky with this Stark Trek Enterprise Feeding system. A space ship spoon with LED lights will get your little explorer interested in Operation: Peas and Carrots! The set is BPA and phthalate free – and a lot of fun. The space themed bib keeps the home planet nice and clean, and also lights up with motion-activated LED lights to double the fun. Although a registered Star Trek collectible, the Feeding System Kit is completely easy to clean. The three spoon attachments are dishwasher safe, and the light up bib wipes clean with a wet sponge. Star Trek fans will obsess over the replica USS Enterprise NCC-1701 spoon from the James T. Kirk days, as will your little one. The ship’s motion censored LED lights are activated, and blink excitingly as the ship comes in for a landing – right into your baby’s mouth! The future of feeding is now here – well at least for Star Trek fans. The whole set, including batteries, is just $24.99. Now both you and your child will have a great time as the Enterprise moves in to visualize whirled peas. Trekkie parents, dinnertime just got out of this world! 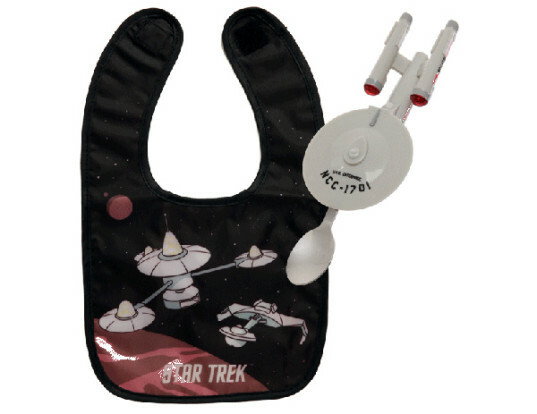 Get geeky with this Stark Trek Enterprise Feeding system. A space ship spoon with LED lights will get your little explorer interested in Operation: Peas and Carrots! The set is BPA and phthalate free - and a lot of fun.